Welcome to Genki Japan.net. Learn Japanese, in a fun, genki way. Japanese is a cool language to learn, and I'll show you how to make it easy! Learn Japanese cool, useful words and phrases. Tips I used to get fluent in Japanese. Learn how to read Japanese katakana and hiragana + Other Japanese symbols. 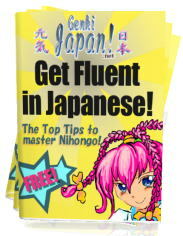 You can also sign up for my weekly "Learn Japanese FAQ" newsletter and get my "Get Fluent in Japanese" eBook worth $19.99 completely FREE! We hate spam & will only use your email to send you the link to download your free book and your daily newsletter. WARNING: One listen and these songs will stick in your head all day. Luckily the Japanese will stick there too. 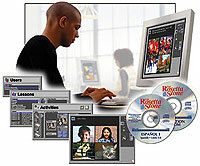 Available as YouTube videos and mp3s. The best way to learn. They take around 20 minutes each, the trick is to make lots of mistakes and click on any answer if you're not sure! If you're a teacher in Japan, your students might like the original versions of these games. Some videos of some of the more unusual, but cool, things you see as you travel round Japan! Here are my reviews of some of the better materials out there for learning Japanese. All of them are good, if you bought them all your Japanese would be amazing! Using Flash technology, have a go at playing this traditional Japanese instrument on your computer! Keep checking back for more articles and info at GenkiJapan.net !
. This site is funded by sales of Genki English educational supplies. Copyright 2000/2010 Richard Graham GenkiJapan.net All rights reserved.